All animals, including humans, are made up of cells. The cell, the basic unit of life, can be identified under a microscope by its outer membrane and a nucleus within the membrane. Some cells are able to produce a protein called collagen. In this book, the term "collagen" refers to collagen as well as collagen-like proteins. This process occurs inside the cell. Little globules called vesicles carry the collagen from the inside of the cell to the cell membrane where it is released to the outside of the cell. There, the collagen thickens into fibers. ameloblasts, which produce collagen for the structural foundation and framework upon which calcium and phosphate are deposited, giving rise to tooth enamel. odontoblasts, which produce collagen for the structual foundation and framework upon which calcium and phosphate are deposited, giving rise to the inner part of the tooth. This material is called dentin. Like other proteins, collagen is composed of amino acids linked together in a chain. However, collagen contains two additional amino acids, hydroxyproline and hydroxylysine, not found in other proteins. Thus when collagen breaks down, the hydroxyproline and hydroxylysine levels in the blood and urine increase. Researchers from Harvard University and the National Institutes of Health knew in the 1960s that fluoride disrupted collagen synthesis. It was not until 1979-1981, however, that a new flurry of research activity in this area began. In 1981, Dr. Kakuya Ishida of the Kanagawa Dental University in Japan reported the results of studies in which he fed laboratory animals 1 part per million fluoride in their drinking water and analyzed the urine for hydroxyproline. He found that urinary hydroxyproline levels increased in those animals. This indicates that as little as 1 part per million fluoride interferes with collagen metabolism and leads to its breakdown. Dr. Marian Drozdz and co-workers from the Institute of Bioanalytical and Environmental Studies in Katowice, Poland found increased hydroxyproline and hydroxylysine levels in the blood and urine as well as a decrease in skin and lung collagen levels in rats fed 1 part per million fluoride in their drinking water. Dr. Anna Put and co-workers from the Department of Pharmacology of the Pomorska Akademy of Medicine in Szczecin, Poland also found that fluoride increased hydroxyproline levels in urine. Drs. A.K. Susheela, Y.D. Sharma and co-workers from the All-India Institute of Medical Sciences found that fluoride exposure disrupts the synthesis of collagen and leads to the breakdown of collagen in bone, tendon, muscle, skin, cartilage, lung, kidney, and trachea. As already noted, small vesicles transport collagen from the inside of the cell to the outside of the cell. Drs. Harold Fleming and Val Greenfield of Yale University School of Medicine found a larger number of these vesicles in collagen forming cells (ameloblasts) in animals exposed to fluoride. This work was recently confirmed by S. Chen and D. Eisenmann of the University of Illinois, who also found a fluoride-induced increase of these granules in ameloblasts. It appears that fluoride disruption of collagen synthesis in cells responsible for laying down collagen leads these cells to try to compensate for their inability to put out intact collagen by producing larger quantities of imperfect collagen and/or noncollagenous protein. In 1983, Dr. John R. Farley and co-workers from Loma Linda University showed that treatment of bone cells with less than 1 part per million fluoride increased collagen formation by 50 percent. One year later, Dr. J.R. Smid and co-workers from the Department of Oral Biology at the University of Queensland in Australia found that fluoride ingestion led to an increase of noncollagen proteins as well as collagen proteins. This is supported by the works of Drs. J.H. Bowes and M.M. Murray, Dr. Kh.A. Abishev and co-workers, and Dr. B.R. Bhussry who report a vastly higher protein content in teeth and bone damaged by fluoride. Clinical findings also show that new irregular bone growth is stimulated by fluoride. The drawings below illustrate the effect of fluoride on collagen metabolism. While collagen is made by many different types of cells and, under normal circumstances, is only mineralized in teeth and bones, the body obviously has some mechanism to mineralize the collagen of some tissues while leaving the collagen of other tissues, such as skin, ligaments, tendons, etc., unmineralized. During the aging process, the body loses its ability to discriminate between which tissues should be mineralized and which tissues should not. As will be shown, consumption of fluoride results in the same loss of the body's ability to discriminate. In other words, mineralization of tissue, such as bone, which should be mineralized, is disrupted, and tendons, ligaments, muscles, and other soft tissue which should not be mineralized start to become mineralized as a result of fluoride exposure. By interfering with collagen production, fluoride leads to the production of larger quantites of imperfect collagen and/or other types of protein and thus interferes with the body's normal regulation of collagen mineralization. The type and array of collagen and collagen-related proteins made by the various collagen-producing cells determine whether or not the collagen framework will be mineralized. During the aging process, cumulative damage to these cells leads to the diseases attributed to "old age" - arthritis, arteriosclerosis, brittle bones, wrinkled skin, etc. Consumption of fluoride produces the same effects and results in the same diseases. Now let's look at the bone. Unlike the ameloblasts, and odontoblasts of teeth whose regenerative activity stops after tooth development, osteoblasts continue to actively lay down collagen, and new bone formation continues to take place. If a tooth breaks or fractures, you're out of luck. The damage cannot be repaired. However, if a bone breaks or fractures, osteoblasts lay down collagen to produce a framework for new bone formation to repair the damage. Bone also has the ability to rejuvenate itself. As older bone is removed by bone scavenger cells called osteoclasts, osteoblasts lay down collagen to produce a framework for new bone formation to renew the skeletal structure. Thus, damage to collagen production in bone can interfere with the normal processes of bone rejuvenation and repair throughout life. The balls and sockets of bones are lined with a smooth, tough elastic substance called cartilage. Maintaining the integrity of cartilage depends largely upon the ability of cells called chondroblasts to lay down noncalcified collagen which is the major structural component of cartilage. Fluoride has been shown to interfere with collagen formation in osteoblasts and chondroblasts. If, as pointed out, increased production of imperfect collagen or collagen-like protein results in mineralization of tissues which should not be mineralized, and vice versa, one would expect a calcification of ligaments, cartilage, and tendons as well as the formation of poorly and overly mineralized bone. This is exactly what happens after exposure to fluoride. - The most noticeable changes are detected in the spine with calcification of various spinal ligaments, resulting in pronounced bony outgrowths. The other bones show numerous spiky outgrowths especially in tendons (collagen-rich fibrous tissue which attach muscles to bone) and ligaments (collagen rich fibrous tissue which holds bones together). Under careful inspection, the bony outgrowths are found to consist of coarse, woven fibers which are largely uncalcified. and interosseous membranes (membranes between bones in arms and legs). - In more advanced cases of fluoride exposure, bones become held together by masses of new bone laid down in the joint socket, ligaments and tendons. This results in the locking up of joints and permanent inability of victims to move or flex their joints. Vertebrae become fused at many places. This results in the characteristic "hunch back" symptom of skeletal fluorosis. - There is a low degree of remineralization of the bone itself, which is partly due to a wide seam of uncalcified osteoid (collagen). In 1973, Dr. Jolly and co-workers presented radiological evidence of skeletal fluorosis which results in these bone deformities in parts of India where the drinking water contained as little as 0.7 parts per million fluoride, with the occurrence and severity increasing with increasing levels of fluoride in the drinking water. In 1985, Dr. I. Arnala and co-workers of Kuopio University in Finland reported that: "The upper limit for fluoride concentration in drinking water that does not increase the amount of unmineralized bone is roughly 1.5 parts per million. ...We should however, recognize that it is difficult to give a strict value for a safe concentration in drinking water because individual susceptibility to fluoride varies." In addition to fluoride-induced bone irregularities, one could expect that the fluoride-induced irregularities of the joint cartilage (which is normally smooth) would result in the irritation and inflammation commonly referred to as arthritis. One could also expect fluoride to cause an increase in the incidence of fractures and a decrease in the body's ability to heal bone breaks and bone fractures. Clinical observations show that this is exactly what happens. Drs. Singh and Jolly point out that early symptoms of fluoride-induced damage to bones and cartilage start with "vague pains noted most frequently in the small joints of the spine. These cases are frequent in the endemic [local] areas and may be misdiagnosed as rheumatoid or osteoarthritis. "In later stages, there is an obvious stiffness of the spine with limitation of movements, and still later, the development of kyphosis [hunch back]. "Some patients complain of dyspnea, [difficulty in breathing] on exertion because of the rigidity of the thoracic cage." Dr. Jolly and co-workers reported these symptoms in parts of India where the drinking water contains as little as 0.7 parts per million fluoride, the occurrence and severity increasing as the fluoride content in the drinking water increased. In the United States, Dr. George Waldbott also diagnosed some of the early symptoms listed above, including arthritis and joint pains, as being due to the consumption of water fluoridated at 1 part per million. He was able to bring about a reversal in these symptoms by eliminating fluoridated water from the patients'diets. However, if left unattended, the degeneration leads to the advanced stages of arthritis and "old age." Similar arthritic symptoms have been reported among people exposed to air-borne fluoride in Switzerland, Germany, Britain, United States, Canada, and North Africa. Dr. Yiamouyiannis was contacted by an independent British broadcasting company who consulted him concerning a problem they had found in a brick manufacturing area about 50 miles outside of London where they reported that over 90% of the population was suffering from arthritis induced by air-borne fluoride. "Among the elderly, arthritis of the spine is an especially common ailment that is customarily attributed to 'aging.' Since fluoride retention in bones increases as a person grows older, how can we disregard the possibility that this 'old age' disease might be linked with fluoride intake? For example ... [others have] described in detail X-ray changes encountered in skeletal fluorosis in North Africa, that are in every respect identical to those present in the arthritic spine of the elderly." In 1978, Dr. J.A. Albright and co-workers from Yale University reported at the Annual Meeting of the Orthopedics Research Society that as little as 1 part per million fluoride decreases bone strength and elasticity. In 1983, Dr. B. Uslu from Anadelu University School of Medicine in Eskisehir, Turkey reported that addition of fluoride to the drinking water of rats with fractured bones resulted in defective healing of the fracture due to disruption of collagen synthesis. In 1978, the Journal of the American Medical Association published an editorial pointing out that "in several short-term studies, fluoride has been administered for treatment of involutional osteoporosis, alone or with supplemental calcium, vitamin D or both. No studies have demonstrated alleviation of fracture[s]. ... However, studies in humans have shown an increased incidence of... fractures. When high doses of fluorides have been given to animals receiving a diet that was otherwise unchanged, most studies have shown no change or a decrease in the strength of the bone." They also pointed out that administration of fluoride resulted in nonmineralized seams in bones, resulting in the disease called osteomalacia. These nonmineralized seams imply that breaks and fractures in the patients' bones would tend to heal more slowly. It is ironic that anyone would ever think of treating osteoporosis (a disease in which the bones lose calcium) with fluoride, a substance which leads to decalcification of bone. In 1977, Dr. Jennifer Jowsey, one of the originators of fluoride therapy for osteoporosis, admitted that fluoride was leading to a greater degree of osteoporosis (demineralization) in some bones while leading to osteosclerosis (overmineralization) in others. In other words, fluoride treatment of osteoporosis "robs Peter to pay Paul" and leads to a general weakening of the bones. In 1980, Dr. J.C. Robin and co-workers from the Roswell Park Memorial Institute confirmed the foolishness of using fluoride for the treatment of osteoporosis by publishing their results in the Journal of Medicine. According to the authors, "fluoride had no preventive effect. In some experiments there was even a deleterious effect of fluoride." They found fluoride accelerated the process of osteoporosis leading to a loss of calcium from the bone. Claims that the amount of fluoride found in fluoridated water would help prevent osteoporosis have been studied epidemiologically. Researchers from the U.S. National Center for Health Statistics claimed to find no preventive effect, while researchers from the National Board of Health in Finland claim to find a preventive effect. However, the number of people examined in these two studies was far too small to yield statistically meaningful results. The studies of Drs. Singh and Jolly as well as the studies of Dr. I. Arnala and co-workers who report increases in unmineralized bone, are consistent with the finding of Dr. Robin that fluoride accelerates the process of osteoporosis. In a number of areas where people consume water containing 3 parts per million fluoride or more, calcification of the arteries has been clinically correlated with the fluoride-induced bone disorders described in Chapter 6. The indication again is that fibroblasts in the arterial cell walls are producing larger amounts of an imperfect collagen or collagen-like protein, resulting in hardening of the arteries or arteriosclerosis, the leading cause of death in the United States. As pointed out in Chapter 4, all animals, including humans, are made up of cells. Each cell contains a nucleus, which is separated from the remainder of the cell by a nuclear membrane. Within the nucleus exist chromosomes, which contain DNA and protein. DNA is the body's master blueprint material. It is the genetic material that determines how the body is built. DNA specifies traits such as height, hair texture and color, number of fingers on each hand, blood type, and by means of its control of protein and enzyme synthesis, the susceptibility of the individual to various diseases. Since maintaining the integrity of this master blueprint is so vital, the cell makes a "photocopy" of the DNA called RNA, so that the risk of damaging the DNA is minimized. This photocopy blueprint is taken to "construction sites" in the cell. These construction sites are called ribosomes. On these ribosomes, the RNA blueprint is used to direct the manufacture of proteins and enzymes, which, in turn, directly determine the structure, traits, and limiting capabilities of the body. Serious consequences can also arise if the unrepaired DNA damage occurs in a cell which gives rise to a sperm or egg cell. In these cases, DNA damage in the defective egg or sperm cell will be replicated in every cell of the offspring's body and will lead to a birth defect. If the child with this birth defect survives to maturity and reproduces, this genetic deformity will be passed on from generation to generation. A decline in DNA repair activity with "age" is one of the reasons why the number of birth defects increases as maternal age increases. Unrepaired damage of a segment of the DNA responsible for control of cell growth (brought about by a deficient DNA repair enzyme system) can lead to uncontrolled cell growth or tumors. Many tumors stop growing when they are contained by the cells around them. However, in some cases, tumor cells may release an enzyme, or may be induced by additional genetic damage to release an enzyme, which digests the surrounding cells. The result is an invasive or malignant tumor and is more commonly referred to as cancer. An excellent example of a defective DNA repair enzyme system leading to cancer is provided by victims of a disease called xeroderma pigmentosum. These people suffer from an inherited deficiency of DNA repair enzyme activity and are known to succumb to cancer early in life as a result. A decline in DNA repair activity with "age" is one of the primary reasons why the incidence of cancer among older people is so much higher than the cancer incidence among younger people. The defective DNA repair enzyme in patients with xeroderma pigmentosum accelerates the aging process to the extent that xeroderma pigmentosum patients in their 20's have the same cancer risk as "normal" people in their 80's. Dr. Wolfgang Klein and co-workers at the Seibersdorf Research Center in Austria reported that 1 part per million fluoride inhibits DNA repair enzyme activity by 50%. Since fluoride inhibits DNA repair enzyme activity, fluoride should also be expected to lead to an increase in genetic or chromosome damage. This has indeed been found to occur in numerous studies showing that fluoride in water, even at the concentration of 1 part per million, can cause chromosome damage. The following table outlines the results of laboratory studies regarding the effect of fluoride on genetic damage in mammals. *A prepublication copy of this paper was submitted as an exhibit in a court case in Pittsburgh (USA). During trial, it was brought out that the results showed that increasing fluoride contents in drinking water increased genetic damage in mouse testes cells. Before the paper was published these figures were altered so as to destroy the original figures showing a relation between fluoride and genetic damage (see Chapter 16). Chromosomes (and thus any chromosomal abnormalities that may occur) are only visible while the cell is dividing. Therefore, Dr. Mohamed studied bone marrow and testes cells since these cells divide rapidly. Since the testes cells observed by Dr. Mohamed give rise to sperm cells which are passed on to future generations, genetic damage to these testes cells can lead to birth defects and other metabolic disorders which can be passed on from generation to generation. Early studies regarding the ability of fluoride to cause chromosome damage were done on plants and insects and as a result drew little attention. However, since the basic structure, function, and repair of chromosomes is similar in plants, insects, and animals, substances like fluoride which cause genetic damage in plants and insects, will most likely cause genetic damage in animals-including man. The following table outlines the results of laboratory studies regarding the effect of fluoride on genetic damage in plants and insects. Drs. R.N. Mukherjee and F.H. Sobels from the University of Leiden in Holland found that fluoride increased the frequency of genetic damage in sperm cells which were produced by laboratory animals exposed to X-rays. It is evident, from their studies, that fluoride inhibited the repair of DNA damaged X-rays. The authors themselves concluded: "sodium fluoride resulted in a consistent and highly significant increase of the mutation [i.e. genetic damage] frequency. This effect is thought to result from interference with a repair process." In agreement with Drs. Mukheijee and Sobels were Dr. S.I. Voroshilin and co-workers from the Russian Research Institute of Industrial Health and Occupational Diseases. From their studies they concluded: "It would seem to us that fluoride could cause some kind of disturbance in the enzymes that are related to the mechanisms of DNA repair and synthesis." In 1981, Dr. A. Iarez and co-workers from the Department of Toxicology from Central University ofVenezuela in Caracas, reported that fluoride added to the drinking water of female rats produced birth defects in their offspring. Just one year later Drs. Rhuitao Zhang and Shunguang Zhang of the Changjian Institute of Marine Products found that fluoride caused birth defects in fish. According to the June 16, 1976 issue of the San Diego Union, an experiment showed that 10% of the litters of female mice drinking tap water from Durham, North Carolina (fluoridated in 1962) contained at least one malformed baby. No birth defects were observed in mice drinking purified water. While this study in itself does not prove that fluoride was the cause, the effects of fluoride as determined by the investigators mentioned above certainly make fluoride a prime suspect. The ability of fluoride to cause genetic damage is so well recognized that investigators are now trying to find ways to counteract its genetic damaging effects. Substances like fluoride which cause genetic damage are called mutagenic substances and it is a well-accepted fact that substances which are mutagenic also tend to be carcinogenic, or cancer producing. In fact, this is exactly what has been found with regard to fluoride. Dr. Takeki Tsutsui and co-workers of the Nippon Dental College in Japan showed that fluoride not only caused genetic damage but was also capable of transforming normal cells into cancer cells. The levels of fluoride used in this study were the same levels of fluoride that the U.S. National Cancer Institute suggested should be used to determine whether or not fluoridation of public water supplies causes cancer. They found that cells treated with 34 and 45 parts per million fluoride produced cancer (fibrosarcoma) when injected under the skin of otherwise healthy adult hamsters. In contrast, they found that cells that were not treated with fluoride did not produce cancer. This confirms the earlier U.S. National Cancer Institute sponsored studies done by Drs. Irwin Herskowitz and Isabel Norton. 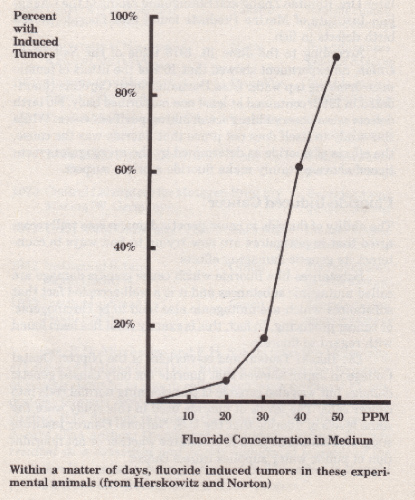 In 1963, these St. Louis University scientists showed that low levels of fluoride increased the incidence of melanotic tumors in fruit flies by 12 to 100% (see the following figure). Similar types of transformations of normal cells to potentially cancerous cells have been observed in humans. Dr. Danuta Jachimczak and co-workers from the Pomeranian Medical Academy in Poland reported that as little as 0.6 part per million fluoride produces chromosomal damage in human white blood cells. This study has received support from two other studies by Dr. R. Lin and co-workers from the Kumming Institute of Zoology and Dr. E.J. Thomson and co-workers from the Medical Research Council in Edinburgh, Scotland, who showed a 2-fold to 15-fold increase in chromosomal aberration rates at levels of 1.5 to 60 parts per million fluoride. The Thomson study suffers from the fact that the investigators administered another mutagenic substance to all the cells tested to measure other indexes of chromosomal activity. Dr. Stephen Greenberg from the Chicago Medical School observed a disturbance of the DNA in white blood cells of animals treated with 5-10 ppm fluoride and observed other changes which he maintained were characteristic of cancer cells. In humans, Dr. Paul H. Duffey and co-workers from the Tucson Medical Center also found that fluoride transforms certain white blood cells into cells which appeared to be cancerous. It is quite clear that fluoride causes genetic damage. The mechanism of action of fluoride cannot be exactly pinpointed because fluoride interferes with a number of physiological processes. Most evidence indicates that fluoride acts on the DNA repair enzyme system. This does not rule out the possibility that fluoride also interferes with DNA synthesis or that it may even act directly on the DNA itself. DNA is composed of two molecular strands held together by hydrogen bonds and fluoride is capable of disrupting these bonds. Such disruption would be expected to result in genetic damage directly and/or interference with DNA synthesis and DNA repair. Furthermore, fluoride-induced genetic damage may also result from the general metabolic imbalance caused by fluoride selectively inhibiting certain enzymes. The fact that fluoride has also been shown to cause cancer should not be surprising since it is almost universally accepted that cancer results from genetic damage. In any event, the fact that fluoride disrupts DNA repair enzyme activity, the fact that fluoride causes genetic damage, and the fact that fluoride causes cancer shows again that fluoride is directly accelerating the aging process. L. Golub, et al., "The Effect of Sodium Fluoride on the Rates of Synthesis and Degradation of Bone Collagen in Tissue Culture," Proceedings of the Society for Experimental Biology and Medicine, Volume 129, pp. 973-977 (1968). W.A. Peck, et al., "Fluoride Inhibition of Bone Collagen Synthesis," Clinical Research, Volume 13, p. 330 (1965). Kakuya Ishida, "The Effects of Fluoride on Bone Metabolism," Koku Eisei Gakkai Zasshi, Volume 31, No. 2, pp. 74-78 (1981). Marian Drozdz, et al., "Studies on the Influence of Fluoride Compounds upon Connective Tissue Metabolism in Growing Rats," Toxicological European Research, Volume 3, No. 5, pp. 237, 239-241 (1981). Marian Drozdz, et al., "Studies on the Influence of Fluoride Compounds upon Connective Tissue Metabolism in Growing Rats. 11. Effect of Sodium Fluoride With and Without Simultaneous Exposure to Hydrogen Fluoride on Collagen Metabolism," J. Toxicol. Med., Volume 4, pp. 151-157 (1984). Anna Put, et al., "Effect of Chronic Administration of Sodium Fluoride and Calcium Carbonate on Some Biochemical Changes in Rats," Bromatol. Chem. Toksykol., Volume 16, pp. 219-224 (1983). Wieslawa Jarzynka and Anna Put, "Effect of Chronic Fluoride Poisoning on the Morphological Appearance of Dentin in White Rats," Czas. Stoma., Volume 37, pp. 169-175 (1984). A.K. Susheela and Mohan Jha, "Effect of Fluoride on Cortical and Cancellous Bone Composition," IRCS Medical Sciences: Library Compendium, Volume 9, No. 11, pp. 1021-1022 (1981). Y.D. Sharma, "Effect of Sodium Fluoride on Collagen Cross-link Precursors," Toxicological Letters, Volume 10, pp. 97-100 (1982). A.K. Susheela and D. Mukerjee, "Fluoride Poisoning and the Effect of Collagen Biosynthesis of Osseous and Nonosseous Tissues of Rabbit," Toxicological European Research, Volume 3, No. 2, pp. 99-104 (1981). Y.D. Sharma, "Variations in the Metabolism and Maturation of Collagen after Fluoride Ingestion,"Biochimica et Biophysica Acta, Volume 715, pp. 137-141 (1982). Harold Fleming and Val Greenfield, "Changes in the Tbeth and Jaws of Neonatal Webster Mice After Administration of Sodium Fluoride and Calcium Fluoride to the Female Parent During Gestation," Journal of Dental Research, Volume 33, No. 6, pp. 780-788 (1954). S. Chen and D. Eisenmann, "Calcium Shifts in Ameloblasts During Experimentally Altered Enamel Formation," Journal of Dental Research, Volume 6, p. 372 (1985). John R. Farley, et al., "Fluoride Directly Stimulates Proliferation and Alkaline Phosphatase Activity of Bone Forming Cells," Science, Volume 222, pp. 330-332 (1983). J.R. Smid, et al., "Effect of Long-Tbrm Administration of Fluoride on the Levels of EDTA-Soluble Protein and Gamma CarWxyglutamic Acid in Rat Incisor Teeth,"Journal ofDentalResearch, Volume 63, pp. 1061-1063 (1984). J.H. Bowes and M.M. Murray, "A Chemical Study of 'Mottled Teeth' from Maldon, Essex," British Dental Journal, Volume 60, pp. 556-562 (1936). Kh. A. Abishev, et al., "Molecular Composition of Bones During Chronic Fluoride Poisoning," Zdravookr. Kaz, Volume 30, No. 5, pp. 28-30 (1971). B.R. Bhussry, "Chemical and Physical Studies ofEnamel from Human Teeth,", Journal of Dental Research, Volume 38, pp. 369-373 (1959). M. Soriano, "Periostitis Deformans Due to Wine Fluorosis," Fluoride, Volume 1, pp. 56-64 (1968). Amarjit Singh and S.S. Jolly, "Chronic'fbxic Effects on the Skeletal System," Fluorides and Human Health, World Health Organization, Geneva, Switzerland, 1970, pp. 238-249. Amarjit Singh, et al., "Skeletal Changes in Endemic Fluorosis," Journal of Bone and Joint Surgery, Volume 44 B, No. 4, pp. 806-815 (1962). S.S. Jolly, et al., "Endemic Fluorosis in Punjab," Fluoride, Volume 6, pp. 4-18 (1973). George Waldbott, et al., Fluoridation: The Great Dilemma, Coronado Press, Lawrence, Kansas, 1978, 423 pp. J.A. Albright, "Me Effect of Fluoride on the Mechanical Properties of Bone," 7),ansactions of the Annual Meeting of the Orthopedics Research Society, 1978, pp. 3, 98. B. Uslu, "Effect of Fluoride on Collagen Synthesis in the Rat," Research in Experimental Medicine, Volume 182, pp. 7-12 (1983). Stephen Marks, "Restraint and Use of High-Dose Fluorides to Treat Skeletal Disorders," Journal of the American Medical Association, Volume 240, No. 15, pp. 1630-1631 (1978). Jennifer Jowsey, Comments made at the 1977 National Convention of the American Association of the Advancement of Science in Denver, Colorado. J.C. Robin, et al., "Studies on Osteoporosis Ill. Effect of Estrogens and Fluoride," Journal of Medicine, Volume 11, No. 1, pp. 1-14 (1980). J.C. Robin and J.L. Ambrus, "Studies on Osteoporosis IX. Effect of Fluoride on Steroid Induced Osteoporosis," Research Communications in Chemical Pathology and Pharmacology, Volume 37, No. 3, pp. 453-461 (1982). Jennifer Madans, et al., "The Relationship between Hip Fracture and Water Fluoridation: An Analysis of National Data," American Journal of Public Health, Volume 73, pp. 296-298 (1983). Olli Simonen and Ossi Laitinen, "Does Fluoridation of Drinking Water Prevent Bone Fragility and Osteoporosis? "Lancet (August 24,1985), pp. 432-434. Ilkka Arnala, et al., "Effect of Fluoride on Bone in Finland," Acta Orthopaedica Scandinavia, Volume 56, pp. 161-166 (1985). L.J. Ream and P.B. Pendergrass, 'The Effects of Fluoride on the Periosteal and Endosteal Surfaces of the Rat Femur," Journal of Submicrosc. Cytology, Volume 14, No. 1, pp~ 81-91 (1982). John Little, "Relationship Between DNA Repair Capacity and Cellular Aging," Gerontology, Volume 22, pp. 28-55 (1976). Wolfgang Klein, et al., "DNA Repair and Environmental Substances," Zeitschrift fur AngewanilteRader und Klimaheilkunde, Volume 24, No. 3, pp. 218-223 (1977). Wolfgang Klein, et al., "Biochemical Research on the Action of Sodium Fluoride on Mammalian Cells. The Effect on Biosynthesis of Nucleic Acid and Proteins on Mouse Spleen Cells in in Vivo Studies," Report ofthe Austrian Society of Atomic Energy, Seibersdorf Research Center, No. 2355, pp. 1-10 (1974). Wolgang Klein, et al., "DNA Repair and Environmental Substances," Report of the Austrian Society of Atomic Energy, SeibersdorfResearch Center, No. 2613, pp. 1-9 (1976). S.I. Voroshilin, et al., "Cytogenetic Effect of Inorganic Fluorine Compounds on Human and Animal Cells in Vivo and in Vitro," Genetika, Volume 9, No. 4, pp. 115-120 (1973). Georgiana Jagiello and Ja-Shein Lin, "Sodium Fluoride as Potential Mutagen in Mammalian Eggs," Archives of Environmental Health, Volume 29, pp. 230-235(1974). Danuta Jachimczak and Bogumila Skotarczak, "The Effect of Fluorine and Lead Ions on the Chromosomes of Human Leucocytes in Vitro." Genetica Polonica, Volume 19, No. 3, pp. 353-357 (1978). George Martin, et al., "Lack of Cytogenetic Effect in Mice or Mutations in Salmonella Receiving Sodium Fluoride," Mutation Research, Volume 66, pp. 159-167 (1979). A.A. Aliev and D.A.Babaev, "Cytogenetic Activity of Vitamins in Bone Marrow Cells of Rat Femurs in Sodium Fluoride-Induced Mutation Conditions," Tsitol. Genet., Volume 15, pp. 19-23 (1981). A.A. Aliev, et al., "Effect of alpha-Ibeopherol on the Level of Chromosome Aberrations Induced by Sodium Fluoride in Rat Femur Bone Marrow Cells," Izv. Akad. Nauk Az. SSR Ser. Biol. Nauk., No. 1, pp. 17-20 (1981). V. Yu Akhundov, et al., "Effect of Combined and Separate Exogenous Vitamin Administration on the Level of Chromosomal Aberrations Induced by Sodium Fluoride in Rats in Subacute Experiments," Izv. Akad. Nauk Az. SSR, Ser. Biol. Nauk, No. 4, pp. 3-5 (1981). Aly Mohamed and M.E. Chandler, "Cytological Effects of Sodium Fluoride on Mice," Fluoride, Volume 15, No. 3, pp. 110-118 (1982). Weishun He, et al., "Effect of Sodium Fluoride and Fluoroacetamide on Sister Chromatid Exchanges and Chromosome Aberrations in Cultured Red Muntjac Cells," Huanjing Kexue Xuebao, Volume 3, pp. 94-100 (1983). Takeki Tsutsui, et al., "Sodium Fluoride-induced Morphological and Neoplastic T~ansfbrmation, Chromosome Aberrations, Sister Chromatid Exchanges, and Unscheduled DNA Synthesis in Cultured Syrian Hamster Embryo Cells," Cancer Research, Volume 44, pp. 938-941 (1984). Thkeki Tsutsui, et al., "Cytotoxicity, Chromosome Aberrations and Unscheduled DNA Synthesis in Cultured Human Diploid Fibroblasts Induced by Sodium Fluoride," Mutation Research, Volume 139, pp. 193-198 (1984). A.H. Mohamed, et al., "Cytological Effects on Hydrogen Fluoride on 'Ibmato Chromosomes," Canadian Journal of Genetics and Cytology, Volume 8, pp. 575-583 (1966). A.H. Mohamed, "Cytogenetic Effects of Hydrogen Fluoride Treatment in `Ibmato Plants," Journal of the Air Pollution Control Association, Volume 18, pp. 395-398 (1968). A.H. Mohamed, "Chromosome Changes in Maize Induced by Fluorine Gas," CanadianJournal ofGenetics andCytology, Volume 12,pp. 614-620(1970). A.H. Mohamed, "Induced Recessive Lethals in Second Chromosomes in Drosophila Melanogaster by Hydrogen Fluoride," Proceedings of the Second International Clean Air Congress of the International Union ofAir Pollution Prevention Associations, 1970, p. 26. R.A. Gerdes, et al., "The Effects of Atmospheric Hydrogen Fluoride upon Drosophila Melanogaster," Atmospheric Environ., Volume 5, pp. 113-122 (1971). B. Mitchell and R.A. Gerdes, "Mutagenic Effects of Sodium Fluoride and Stannous Fluoride on Drosophila Melanogaster," Fluoride, Volume 6, pp. 113-117 (1973). E. Vogel, "Strong Antimutagenic Effects of Fluoride on Mutation Induction by Trenimon and 1-Phenyl-3, 3-Dimethyltriazene in Drosophila Melanogaster," Mutation Research, Volume 20, pp. 339-352 (1973). S.S. Bale and G.E. Hart, "Cytogenetic and Genetic Effects of Fluoride on Barley. I. Comparative Study of the Effects of Sodium Fluoride and Hydrofluoric Acid on Seedling Root Tips," Canadian Journal of Genetics and Cytology, Volume 15, pp. 695-702 (1973). S.S. Bale and G.E. Hart, "Cytogenetic and Genetic Effects of Fluoride on Barley. IL Effects of Treatments of Seedling Coleoptiles with Sodium Fluoride," Canadian Journal of Genetics and Cytology, Volume 15, pp. 703712(1973). A.A. Aliev, et al., "Cytogenetic Effect of Sodium Fluoride Treatment ofAllium Fistulosurn L. Seeds," Izv. Akad. Nauk Az. SSR, Ser. Biol. Nauk, No. 2, pp. 8-10 (1982). G.K. Ragamova, et al., "Features of the Modifying Capacity of Mutations in Aegilops Seed Produced Under Various Ecological Conditions," Izv. Akad. Nauk Az. SSR, Ser. Biol. Nauk, No. 4, pp. 21-24 (1983). R.N. Mukheijee and F.H. Sobels, "Me Effect of Sodium Fluoride and Iodoacetamide on Mutation Induction by X-Irradiation in Mature Spermatozoa of Drosophila," Mutation Research, Volume 6, pp. 217-225 (1968). A. larez, et al., "Sodium Fluoride, Fetotoxicity, and Oral Experimental Teratogeny in Rats," Thricological Aspects [9th Annual Symposium of the International Congress of the European Association of Poison Control Centers], 1981, pp. 528-540. Ruitao Zhang and Shunguang Zhang, "Ibxicity of Fluoride to Fish," Huangjing Kexue, Volume 3, pp. 1-5 (1983). Irwin Herskowitz & Isabel Norton, "Increased Incidence of Melanotic Tumors in Two Strains of Drosophila Melanogaster Following Treatment with Sodium Fluoride," Genetics, Volume 48, pp. 307-310 (1963). Danuta Jachimzcak and Bogumila Skotarczak, "The Effect of Fluorine and Lead Ions on the Chromosomes of Human Leucocytes in Vitro," Genetica Polonica, Volume 19, No. 3, pp. 353-357 (1978). Stephen Greenberg, "The Reaction of Mouse Leukocytes to Long-Term Fluoride Exposure," Anatomical Record, Volume 196, No. 2, pp. 266-267 (1980). Stephen Greenberg, "Leukocyte Response in Young Mice Chronically Exposed to Fluoride," Fluoride, Volume 15, No. 3, pp. 119-123 (1982). Paul Duffey, et al., "Giant Cells in Bone Marrows of Patients on High-Dose Fluoride Treatment," Annals of Internal Medicine, Volume 75, pp. 745--747 (1971). Nobutake Kanematsu, "Genetic Toxicity of Biomaterial. DNA Damaging Effects of Sodium Fluoride and Other Fluoride Compounds," Japanese Journal of Oral Biology, Volume 27, pp. 372-374 (1985). V. Ya. Nikiforova, "Mechanism of the Mutagenic Action of Fluoride," Tsitol. Genet., Volume 16, pp. 40-42 (1982). L.S. Strochkova, et al., "Effect of Fluoride on Morphological and Metabolic Modifications in Hela Cell Culture," Tsitologiya, Volume 26, pp. 299-306 (1984). Thshio Imai, et al., "Effects of Fluoride on Cell Growth of Two Human Cell Lines and on DNA and Protein Synthesis in Hela Cells," Acta Pharmacol. 7bxicol., Volume 52, pp. 8-11 (1983). Kataoka Masayuki, "Effect of Sodium Fluoride on Blastogenesis in Mouse Lymphocytes with Special Reference to the Uptake on 3H-Thymidine, 3 H-Uridine, or 'H-Leucine," Shika Gakuho, Volume 84, pp. 229-251 (1984). Chong Chang, "Effect of Fluoride on Nucleotides and Ribonucleic Acid In Germinating Corn Seedling Roots," Plant Physiology, Volume 43, No. 5, pp. 669-674 (1968). V.I. Shepotinovsky and Z.I. Mikashinovich, "Metabolic Response of Leukocytes as an Indicator of Animal Individual Reaction to Stress and Injury-Induced Shock,"Byull. Eksp. Biol. Med., Volume 90, No. 10, pp. 420-422 (1980). Armando Moucdcy, "Histochemical (Glycogen, RNA, and Lipids) Studies of the Liver Cells of Rats Treated with Potable Water Containing Sodium Fluoride in Various Concentrations," Rev. Fac. Odontol. Univ. Sao Paulo, Volume 6, No. 3, pp. 197-215 (1968). George Waldbott, et al., "Genetic Damage, Birth Defects, and Cancer," in Fluoridation: the Great Dilemma, Coronado Press, 1978, pp. 209-238. John Remington Graham and Dean Burk, "Editorial Essay," Fluoride, Volume 17, pp. 63-69 (1984). At the center of the second-generation conspiracy is John Small. While he is only a high school graduate with no college degree, his credentials do include six years as an information officer for a government department on chemical warfare. He is now and has been the U.S. Public Health Service 'expert' on fluoridation since the 1960s. Mr. Small's functions at the USPHS include the writing and printing of anonymous memos, on USPHS letterheads, covering up the harmful effects of fluoridation, and distributing these memos to promoters of fluoridation, and when necessary, geting his hands on memos and reports put out by the government (even the White House) and rewriting them so they no longer express their original concerns about the toxicity and ineffectiveness of fluoridation. Most of the information supplied to dentists and physicians concerning fluoridation comes either directly or indirectly from Mr. Small. He is the cover-up supervisor, an expert relied upon by the USPHS to supply answers to Congress. He also has the task of harassing, intimidating, and destroying anyone whose publications, utterances, or activities work to the detriment of fluoridation. In some cases, he calls upon other divisions of the Public Health Service to 'neutralize' studies or articles showing adverse effects of fluoridation. In 1969, when Dr. Yiamouyiannis was a biochemical editor for Chemical Abstracts Service, the world's largest chemical information center and the largest division of the American Chemical Society, he began to publicly express his concern about the health risks associated with fluoridation. Mr. Small contacted his employer and communicated his displeasure with the statements of Dr. Yiamouyiannis. Dr. Yiamouyiannis was notified by his employer several times and finally told that if he spoke out against fluoridation one more time, he would be fired. He was told that $1.1 million in federal funding was in jeopardy if Chemical Abstracts Service did not shut him up. After the meeting, his employer wrote to Small, "I have again talked to Dr. Yiamouyiannis and I have again made my position as strong and as clear as possible. He will not repeat this kind of performance and remain as an employee of Chemical Abstracts Service." Within weeks after Dr. Yiamouyiannis next spoke out against fluoridation, he was put on probation, was told that he would never receive a raise again, and was advised to find another job. He was ultimately forced to resign. Two years later, Dr. Yiamouyiannis was appointed science director of the National Health Federation where he was able to devote more time on the fluoridation issue. During the 1970s, the fluoridation battle was stalemated. On one side, those opposing fluoridation were winning elections to stop fluoridation. On the other side, there was the force and money and power of the USPHS, the ADA, and industry that kept fluoridation going. In 1978, Yiamouyiannis served as a consultant and witness in a court case in Pennsylvania that proved fluoridation was harmful and banned it. The fluoridation promoters had to do something. In 1979, the American Dental Association came out with a "White Paper on Fluoridation" characterizing fluoridation opponents as either "uninformed or misinformed" or "self-styled experts whose qualifications for speaking out on such a scientific issue as fluoridation were practically nonexistent or whose motivation was self-serving." It suggested that dentists should propagandize politicians while they are in the dental chair. The White Paper proposed setting up the conspiracy between the American Dental Association, Centers for Disease Control, Environmental Protection Agency, National Center for Health Statistics, National Institute of Dental Research, state dental societies, and state dental directors for "identification of communities where the timing for political action is favorable as well as unfavorable and where the opponents of fluoridation are considering the initiation of referendums" and for "promoting fluoridation." It urged that "individual dentists must be convinced that they need not be familiar with scientific reports . . . on fluoridation to be effective participants in the promotion program" and that the ADA should cooperate with the USPHS to get EPA to soften its statements regarding fluoride as a contaminant. It suggested behavioral studies to "help anticipate the behavior of opponents of fluoridation," e.g. studies that would determine "Why would some persons deny the life-long health benefits of fluoridation to children? What kind of mentality would reject the opinion of those who are qualified by education, training and experience . . ."
It suggested that ADA's responses to opponents of fluoridation should be prefaced by: "The ADA reiterated its longstanding support of fluoridation . . . Numerous studies have shown . . . There is no evidence of any relation . . . Investigators have observed . . . ." It suggested that "The advice of behavioral scientists should be sought with regard to more realistic, convincing rebuttals" and that "The ADA should produce a step-by-step manual for the development and conduct of a fluoridation campaign . . . The ADA should provide field assistance if needed in a fluoridation campaign or cooperate with the [US]PHS and state health departments in providing such assistance." This conspiracy solidified in the formation of a planning committee to organize a symposium (sponsored by the United States Department of Health and Human Services (USDHHS), USPHS, Health Resources and Services Administration, Bureau of Health Care and Assistance, Maternal and Child Health Division, Centers for Disease Control, Center for Prevention Services, Dental Disease Prevention Activity, the W. K Kellogg Foundation, Delta Dental Health Plan of Michigan, Blue Cross and Blue Shield of Michigan, and Medical Products Laboratories). This symposium took place at the University of Michigan on August 9-10, 1983. Members of the planning committee included Mr. Small, Mr. James Collins of the CDC, Dr. Stephen Corbin of the USPHS, Dr. Robert Mecklenburg, Chief Dental Officer of the USPHS, Dr. William Warren, Chief Dental Officer of the Department of Health and Human Services, Dr. Joel Boriskin, chairman of the American Dental Association's National Fluoridation Advisory Committee, Dr. Wilbert Fletke of the ADA, Dr. Anthony Kiser of the ADA, Ms. M. Lisa Watson of the ADA, Ms. Martha Liggett of the American Association of Dental Schools, Dr. Michael Easley, formerly of the Ohio Dept. of Health and CDC, and Dr. Ray Kuthy of the Illinois Department of Health, who were and/or are some of the central figures in the conspiracy. The stated purpose of the meeting was to "discuss the status of organized opposition to fluoridation; to analyze probable motives influencing the antifluoride movement; to assess the need for a national fluoridation strategy; to develop political and legal strategies for the defense and promotion of fluoridation; and to evaluate past legal and political profluoridation initiatives, focusing on the defeats as well as the victories." An examination of the seminar speakers, their affiliation, and the content of their presentations provides a further look into the "unamerican" nature of this taxpayer-supported event. Dr. William T. Jarvis, a member of the board of advisors of the American Council on Science and Health (ACSH) and the National Council Against Health Fraud (NCAHF). He spoke on the "Psychology of Antifluoridationism." With regard to those opposing fluoridation, he stated: "I do not believe in providing such people a public platform from which they can create confusion and doubt about fluoridation . . . For several years I have put on fluoridation debates in my dental classes, taking surveys before and after to determine attitudes toward fluoridation. Invariably, each class became more antifluoridationist as a result of the debate." Dr. Sheldon Rovin, a member of ACSH and coauthor with Stephen Barrett of the book, The Tooth Robbers, a book defaming antifluoridationists. He spoke on how to win fluoridation battles through the political process, pointing out that "if it is at all humanly possible, the referendum should be avoided." In the discussion following, Dr. Myron Allukian asked what could be done to stop antifluoridationists from getting signatures to put fluoridation on the ballot. Dr. Stephen Corbin of the USPHS. As chairman of his workshop, he reported that his committee felt "the lead entities, namely the U.S. Public Health Service and the American Dental Association" should accept a plan "to close the 'windows of vulnerability' in our defense." He suggested avoiding trials based on the merits of fluoridation. Finally, he suggested that a mandatory state fluoridation law be developed. During the following discussion, Dr. Easley suggested a conspiracy to deny those seeking relief through the courts their right to due process. Dr. Dennis H. Leverett of the University of Rochester. As chairman of his workshop, he reported that his committee felt that fluoridation was "a political rather than a scientific situation" and encouraged research on the adverse effects of fluoridation "that will presumably show no effect or will show equivocal results." Dr. D. Scott Navarro of Blue Cross/Blue Shield, as chairman of his workshop, suggested that the cost of litigation defending fluoridation should be borne by taxpayers, professional organizations, health groups, universities, and research institutes. Colleen Wulf of the Ohio Department of Health. As chairman of her workshop, she reported that her committee suggested the formation of a nonprofit organization which would coordinate with the CDC and ADA, pointing out that CDC has already drafted promotional materials for fluoride and that the ADA and the USPHS had already formed the Ad Hoc Committee to Plan for the Legal Defense of Community Water Fluoridation. She suggested that the name of the new group might be something like "Coalition for Improved Dental Health or something similar." As a matter of fact, the name of the group ended up being the American Oral Health Institute, incorporated in the state of Ohio on February 19, 1985 as a not-for-profit corporation. In 1985 and 1988, this organization came out with the first and second editions of a book, titled Abuse of the Scientific Literature in an Antifluoridation Pamphlet (ASLAP), edited by Coleen A. Wulf, Karen F. Hughes, Kathleen G. Smith, and Michael W. Easley. The 215-page second edition of this book attacked the 1982, 1983, 1986, and 1988 editions of a very well referenced Question and Answer pamphlet titled Lifesavers Guide to Fluoridation by Dr. Yiamouyiannis that was effectively being used to fight fluoridation. The preparation of this book was a collaborative effort of 18 federal and state health officials who were promoting fluoridation. Those with an asterisk after their name were invited to or attended the University of Michigan on August 9-10, 1983 symposium discussed above. There was not a single scientist among them: 10 were dental hygienists (Colleen A. Wulf*, Karen F. Hughes*, Kathleen G. Smith*, Linda S. Crossett*, Elizabeth King, Sharon Pierce, Ruth Nowjak-Raymer, Beverly Wargo, Geraldine Wirthman, and Karen Zinner), 2 were dentists (Michael Easley* and Elizabeth Bernard), 5 had degrees in public relations, education, psychology, or public health (James Collins*, Taimi M. Carnahan*, Claire Gelband, Judy Harvey, and Helen S. Hill), and one had no college degree at all (John Small*). The person who wrote the introduction was a psychiatrist (Stephen Barrett). . .
With the help of fluoride promoters, Consumer Reports prepared and published a two-part article on fluoride in its July and August 1978 issues. The writer of these articles was Mr. Joseph Botta. Mr. Botta holds a Master of Arts Degree in English, but no scientific degree. In this article he passed along the same lies and slander used by the promoters to the trusting readers of Consumer Reports. The Consumer Reports article on fluoridation is the most artfully written piece incorporating the lies and slander necesssary to discredit the research and personalities of scientists showing that fluoridation is harmful. It is by far the Number One article distributed by the government bureaucrats in their promotion of fluoridation. This is not because government bureaucrats are not skillful liars. It is because, by having their spoon-fed material rewritten and published by a "consumer" magazine, their lies become more believable. Dr. William Bock of the Centers for Disease Control thought it was so good that he ordered 10,000 reprints and paid for them with federal tax dollars. The American Dental Association gave Mr. Botta an award for writing it. This Consumer Reports article was used by U.S. Public Health Service bureaucrats to provide a "scientific" foundation for their views on fluoridation. The situation has become ludicrous. For example, Dr. Vernon Houk, the director of the Environmental Center for Health of the Centers for Disease Control, traveled all the way from Atlanta, Georgia, to St. Paul, Minnesota, to give his "expert" testimony by reading from the Consumer Reports article. The "Big Lie" in this article and the phrase most often quoted from it is the claim that "The simple truth is that there's no "scientific controversy" over the safety of fluoridation." In 1990, Dr. Edward Groth III, the technical director for Consumer Reports, nullified this claim by stating: "The point is that this is a legitimate scientific controversy. Proponents of fluoridation insist that there are no grounds for controversy at all, and with that, I totally disagree." This hasn't stopped proponents from quoting the same phrase to this day. Dr. Stephen Barrett, a psychiatrist, helped in the preparation of the 1978 Consumer Reports article and of the 1988 book Abuse of the Scientific Literature in an Antifluoridation Pamphlet. He has close ties with the American Dental Association, the American Medical Association, and the U.S. Public Health Service. He is a recipient of the FDA award for "quack-busting" and is a coauthor, along with William Jarvis and others, of the 1993 book Readers' Guide to Alternative Health Methods, published by the American Medical Association. In this book, he cites, and gives summaries of, the two publications mentioned above to inform his readers about fluoridation. He is a science and editorial adviser to the American Council on Science and Health. A glimpse into his character can be gained through his habitual use of words to mean their exact opposite. For example, in an article entitled "Poison Mongers," Dr. Barrett refers to people who are trying to stop the addition of fluoride, a poison, to the water supply as poison-mongers. Now a monger is one who sells something, e.g. a fishmonger is a person who sells fish. Therefore, it is quite evident that a poison-monger is a person who sells poison. Thus, one opposed to having fluoride added to the water supply is exactly the opposite of a poison-monger. The word usage of Dr. Barrett is comparable to the process called "Newspeak" described in George Orwell's 1984, where what is true becomes false and what is false becomes true. The first few paragraphs of Dr. Barrett's article "Poison-Mongers" is the best example of how Dr. Barrett has used "Newspeak." "In hundreds of American communities citizens have voted against healthier teeth. "They were confused by poison-mongers. "These alarmists in our society are using confusion and a scare vocabulary as weapons against fluoridation. They are cheating all of us, but especially our children. "The benefits of fluoridation are supported by 10,000 scientific studies which prove the poison-mongers are wrong. "What do the poison-mongers say? "Instead of telling you that fluoride is found naturally in all water, they call it a 'pollutant'. "Instead of telling you that fluoride is a nutrient essential to life, they call it a poison'. "Instead of the big truth, that fluoridation has never harmed anyone, they tell the big lie and say it causes hundreds of ailments." This article was published in newspapers across the country and was printed in the November 1976 issue of the Journal of the American Dental Association. It has also been used by the U.S. Public Health Service in its 'education' of Congressmen and in its campaign to get various areas around the country fluoridated. "I read your letter in Prevention [magazine] with some interest. There have been other attempts to defeat the fluoridationists in court but most have failed. Before investing money, I would like to have full details of what you plan." Thanks, Stephen J. Barrett, MD." "Thank you for your recent telephone call. I am sorry that I could not immediately make the financial commitment which you requested. I know how enthusiastic you are and did not want to raise your hopes until I had a chance to discuss the matter with my group. I am part of a group which is vitally concerned about fluoridation and which has raised a considerable amount of money. We are not yet sure whether it would be more practical to lobby or to go to court in Pennsylvania. The reason your lawsuit interests us is because it might be more practical for us to join your effort rather than go it alone. "Thus we would need to have a detailed, written description of the plans of your suit. Our attorneys would then be in a position to study how it would effect Pa. law and also to estimate the chances of your suit being successful. We would also need some detail as to how the Attorney General's favorable attitude will be used to advantage without this becoming apparent to the American Dental Association. "We realize you are hesitant to say too much about your plans. On the other hand, we could not make a total commitment unless we had full knowledge of what we would be getting for our investment. We realize this asks a lot of you. On the other hand, we think we have a lot to offer. "You may be assured that whatever information you send us will be handled with appropriate discretion. "Sincerely yours, Stephen Barrett, M.D." "He said that there were 1500 people who watched the trial and that the judge had cautioned them about becoming emotional. They were very quiet. The case presented by MOFF included an affidavit from Dr. Waldbott. The attorney general of Minnesota defended and was given 'five days for rebuttal.' According to Mr. Liptak, who again said he went to school with the attorney general, the attorney general said he 'would not furnish a rebuttal'. He merely stated that the new Minnesota law required fluoridation. "Mr. Liptak added that there was an additional legal action scheduled for September. In about two weeks, 500 local citizens were planning to gather at a meeting where the vice-president of a local bank would get from them '3 year notes for $50 each' to help finance the suit. He explained that such mass action would not get them much publicity in Prevention magazine and the National Health Federation. It was their plan to seek further injunctions of this type with eventual overturning of the new state laws. He again asked me for a contribution, even a token one. He added that there might be money left over for use in another state such as Pennsylvania. "On 5/14, Dr. Gross will try to contact leaders of the pro fluoridation forces in the Minnesota Dental Society and will also call the American Dental Association attorney. We have Mr. Liptak's confidence and hope to continue to use it to our advantage. Perhaps the dental society should consider entering the suit as a guardian of the children. It might also be helpful if some quick way could be devised to dissuade the Brainerd residents from their imminent investment in foolishness. "Best wishes, Stephen Barrett, M.D." Ironically, Dr. Barrett is a co-founder of the National Council Against Health Fraud. Subsequently, he and Mary Bernhardt got together and published a book called The Health Robbers, in which they refer to those opposing fluoridation as health robbers. Excerpts from this book, which consist primarily of the substance of his poison-monger article, were reprinted in newspapers around the country, as well as in Family Health Magazine. Teaming up with others of his kind, including Drs. Thomas Jukes, Warren Winklestein, and Joel M. Boriskin, Dr. Barrett complained about and tried to prevent Dr. Yiamouyiannis from speaking before the Faculty Club of the University of California, Berkeley. Together they claimed that Dr. Yiamouyiannis was some disreputable person not deserving a forum at the University of California campus. In another action, Dr. Barrett, Dr. Boriskin and Dr. William Jarvis, who also is on the board of the National Council Against Health Fraud, wrote letters of complaint to the National News Council concerning an article published in the National Inquirer which pointed out that higher cancer risks were associated with fluoridation. An indication of how Barrett's 'Newspeak' is passed down the line to local dentists is evident from the experience Dr. Yiamouyiannis had when he was called in by local residents of St. Charles, Missouri for a debate on fluoridation. When Dr. Michael Garvey, a local dentist, heard that Dr. Yiamouyiannis was going to be the opposition speaker, he refused to participate in the debate. According to the November 12, 1982 St. Charles Post: "Dr. Garvey said American Dental Association Officials had told him, 'running up against Dr. Yiamouyiannis is not recommended'. The man is well-known as an antifluoridation speaker, Dr. Garvey said. 'This guy is a terror.'" Why haven't Consumer Reports, Stephen Barrett and others who issue false and defamatory statements been sued for libel and slander? Why haven't bureaucrats responsible for illegally spending tax monies to influence elections been prosecuted and sent to jail? Why haven't bureaucrats who have lied in court while under oath been prosecuted for perjury? In many cases they have. However, when legal action was taken against Consumer Reports, the court didn't even allow a hearing on the case. The court claimed Consumer Reports' right to freedom of speech outweighed the plaintiffs right to due process of the law. When charges concerning Dr. Schneiderman's alleged perjury in the Pittsburgh court case were brought before the district attorney's office, they pointed out it would be virtually impossible to convict anyone on perjury and they rarely, if ever, prosecute such cases.